Thousands of bikers have joined an organised ride to honour the UK's fallen servicemen and women. 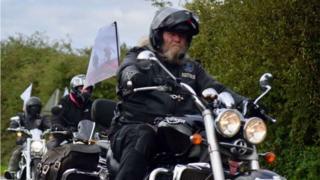 The 10th annual Ride to the Wall event took place at the National Memorial Arboretum, at Alrewas in Staffordshire, and involved more than 7,000 motorcyclists. In the decade it has been running, the event has raised more than £600,000 for the Arboretum. The bikers held a remembrance service on the Armed Forces Memorial. The memorial is engraved with the names of more than 16,000 servicemen and women killed since the end of the Second World War.